and correlate data with known local disease patterns. Setting: Lagos University Teaching Ho spital, Nigeria. ronmental factors that could have triggered the cluster. correlate our data with known local disease patterns. 386 C. BODE ET AL. mean birth weight of 2.6 ± 0.4 kg (range 2.1 - 3.7 kg). Seventeen (68 % ) of these babies were first borns. of 24.5 ± 3.3 years. All the 25 mothers were Nigerian. low socio-economic parts of Lagos. Table 1. 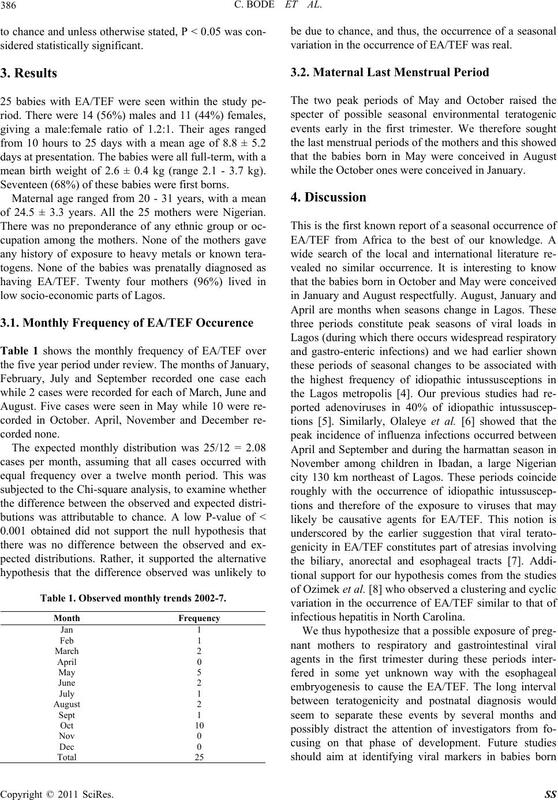 Observed monthly trends 2002-7.
variation in the occurrence of EA/TEF was real. while the October ones were conceived in January. infectious hepatitis in North Carolina. under similar conditions as well as in their mothers. J. F. Felix, M. F. van Dooren, M. Klaasens, W. C. Hop, C.
search. Part A, Clinical and Molecular Teratology, Vol. Teratology, Vol. 36, No. 3, 1987, pp. 363-369. Vol. 66, No. 2-3, 1984, pp. 260-266. 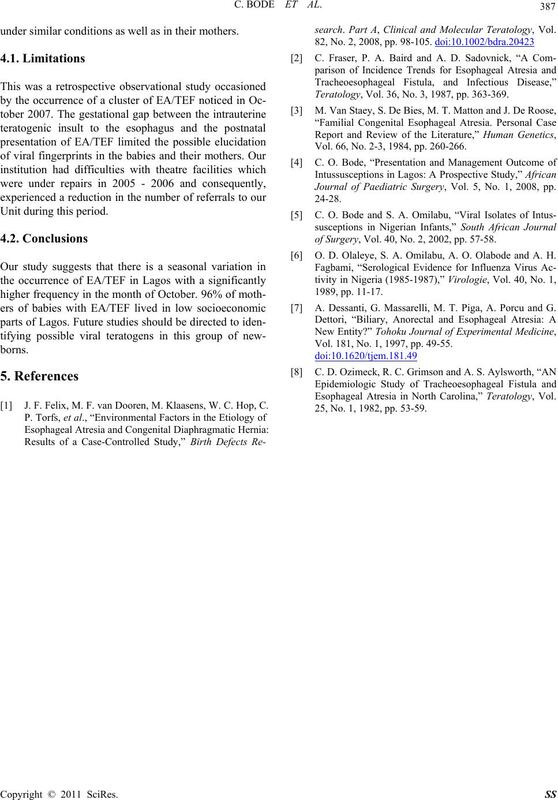 Journal of Paediatric Surgery, Vol. 5, No. 1, 2008, pp. of Surgery, Vol. 40, No. 2, 2002, pp. 57-58. O. D. Olaleye, S. A. Omilabu, A. O. Olabode and A. H.
 A. Dessanti, G. Massarelli, M. T. Piga, A. Porcu and G.
Vol. 181, No. 1, 1997, pp. 49-55. 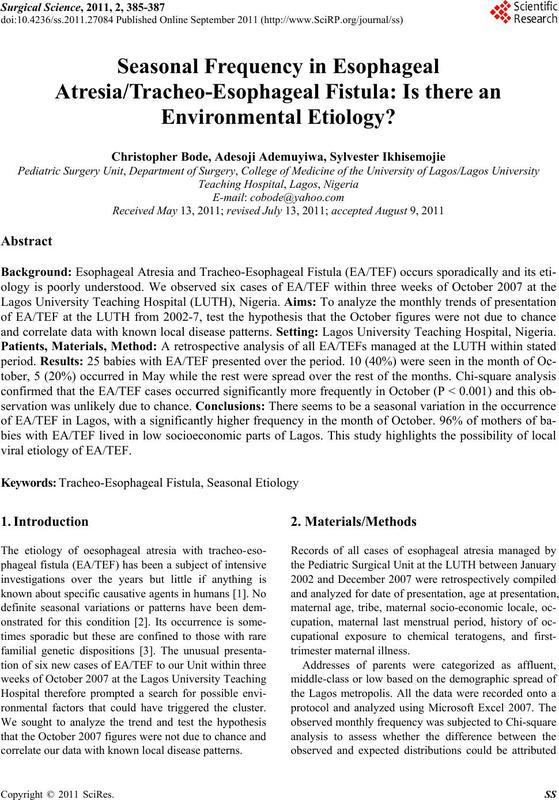 Esophageal Atresia in North Carolina,” Teratology, Vol. 25, No. 1, 1982, pp. 53-59.